Washington, July 19 (IANS) On the eve of Vice President Joe Biden’s visit to India, President Barack Obama has nominated Nisha Desai Biswal, an accomplished Indian-American administrator, as America’s new point person for South Asia. When confirmed by the Senate, Desai will become the first person of Indian or even South Asian origin to head the South Asia bureau of the State Department, which oversees US foreign policy and relations with India, Pakistan, Bangladesh, Afghanistan, Sri Lanka, Nepal, Maldives and Bhutan. Designated as the assistant secretary of state for south and central Asian affairs, she will succeed Robert Blake, a former deputy chief of mission in New Delhi, who is expected to be nominated shortly as the new US ambassador to Indonesia. Biswal is currently assistant administrator for Asia at the US Agency for International Development, which is headed by Rajiv Shah, the highest ranking Indian American in the Obama administration, a position she has held since September 2010. 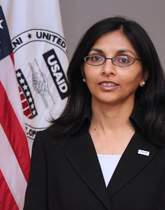 Desai Biswal, who is a graduate of the University of Virginia, began her professional career in Washington DC with the American Red Cross in the mid-90s before she joined USAID in her first stint. As a Hill staffer with the US House of Representatives International Relations Committee from 1999 to 2002, she worked extensively with diplomats from the region before doing another stint with the NGO InterAction. From 2005 to 2010, she was the Majority Clerk for the State Department and Foreign Operations Subcommittee on the Committee on Appropriations in the US, a crucial position for allocation of American foreign aid. Although there have been several other Indian-Americans at the assistant secretary level, namely Bobby Jindal, Richard Varma, Karan Bhatia, Suresh Kumar among them, this is the first time an Indian-American would be heading the South Asia bureau.